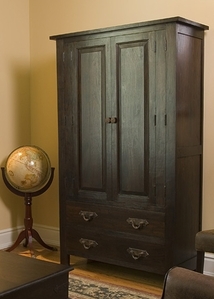 Our selection of rustic armoires and wardrobes is one of the most extensive online. Since 1988, LodgeCraft has been crafting rustic style armoires to provide customers like you with the highest quality furniture around. We also offer a full collection of rustic armoires and wardrobes from hand-selected manufacturers. Not only are our armoires and wardrobes a beautiful statement piece, they are extremely practical as well. You will be able to store all of your clothing and jewelry in one place for easy organization. If you are looking for a certain look to complement your home’s decor, choose from a variety of styles in our rustic armoires and wardrobe collection, including rustic, mission, and log armoires. We also have a great selection of wood types and finish options. Cherry and oak mission style armoires along with hickory are offered online. Pine log armoires and rustic pine or alder armoires are crafted directly in our LodgeCraft workshop in Montana. Browse our collection of rustic armoires and wardrobes below to view the endless possibilities for your rustic style home.